Modern membrane engineering is critical to the development of process-intensification strategies and to the stimulation of industrial growth. 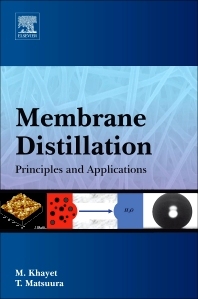 Membrane Distillation (MD) is a broad reference that covers specific information on membranes available and methods for MD membrane preparation and characterization. The book offers an introduction to the terminology and fundamental concepts as well as a historical review of MD development. Commercial membranes used in MD as well as laboratory-made membranes, including emerging membranes, are described in detail and illustrated by a number of clear and instructive schematic drawings and images. Chemical engineers, applied physicists, polymer chemists, materials scientists, environmental scientists and engineers, civil engineers, as well as researchers in fields such as desalination, wastewater treatment, food processing etc. Dr. Takeshi Matsuura is Professor Emeritus of the Industrial Membrane Research Institute (IMRI), University of Ottawa, Ottawa, Canada. He received his BSc. (1961) and MSc. (1963) degrees from the Department of Applied Chemistry at the Faculty of Engineering, University of Tokyo. He pursued his doctoral studies at the Institute of Chemical Technology of the Technical University of Berlin, Germany, and received Doktor-Ingenieur in 1965. After serving at the Department of Synthetic Chemistry of the University of Tokyo as a staff assistant and at the Department of Chemical Engineering of the University of California as a postdoctoral research associate, he joined the National Research Council of Canada in 1969. He came to the University of Ottawa in 1992 as a professor and the holder of the British Gas/NSERC Industrial Research Chair. He served as a professor of the Department of Chemical Engineering and the director of the Industrial Membrane Research Institute (IMRI) until he retired in 2002. He was appointed to Professor Emeritus in 2003. Dr. Matsuura served also at the Department of Chemical and Environmental Engineering of the National University of Singapore as a visiting professor during the period of January to December 2003, and at University Technology Malaysia (UTM), Skudai, Malaysia (currently at the Advanced Membrane Technology Research Centre (AMTEC) of UTM), as a distinguished visiting professor, in years 2007, and 2009-2018. He stayed at the Department of Environmental Engineering and Biotechnology of Myongji University, Yongjin, Korea, from January to April 2008 by the support of the Brain Pool Program. He has published 596 papers with a Scopus h-index of 66. He has also authored and co-authored six books and edited eight books. The recipient of several honors and awards, Dr. Matasuura was most recently awarded an Honorary Doctorate of Engineering on April 29, 2017, at the 59th Convocation Ceremony of Universiti Teknologi Malaysia.